1990 VW T25 Urban Camper converted in 2015 by East Dulwich Campers in 2015. The conversion started by being stripped down to a bare body repaired and repainted in two tone orange and white and the whole underside sprayed in a weather resistant coating. The vehicle is fitted with a fibre glass high top roof rather than an elevating roof which gives better installation and practicality. as part of the conversion the T25 was also fitted with a more modern VW MK3 Golf 2.0 GTi 115BHP engine. The T25 is also fitted with a multipoint injection LPG system to give grater fuel consumption. 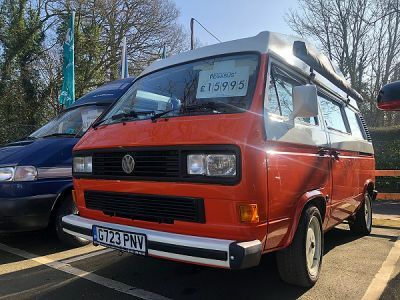 There are also many modern features on the T25, Power steering, cruise control, electric mirrors, central locking and a Bluetooth stereo to name just a few. the interior has been completely retrimmed in a brown close which complements the period of the vehicle. in the rear there is a rock and roll bed to sleep two, ample storage space, a three way fridge, two burner hob, sink, power points, curtains, cassette toilet, LED lighting and propex gas heating system. there is also a second fitted LPG tank for the habitation side of the vehicle. Other extras include square headlamp conversion, swivel seat, solar panel, awning, alloy wheels, GTI steering wheel, alarm and immobiliser and GPS Tracker. The list goes on and on this really in a great opportunity to own a well presented practical classic.